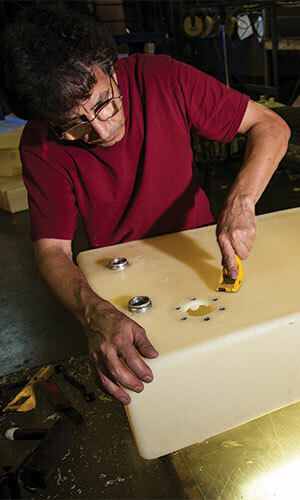 SeaStar Fuel Solutions, located in a 60,000 square-foot manufacturing facility, in Nashville, Tennessee, pioneered the plastic fuel tank industry when its engineering team designed, developed, tested, manufactured and marketed of the first permanently installed cross-linked polyethylene fuel tank in the marine industry. Supported by a team of dedicated employees, the company’s culture is driven by continuous improvement of company systems; manufacturing safe, reliable products and services; and making Inca a great place for its employees to work. A highly qualified team of mechanical, industrial and process engineers ensures design and production of each product to client specifications. • Large enough to satisfy the production needs of many projects, yet still able to provide smaller production runs when needed. • Focused on attentive customer service. • Established the longest marine fuel tank industry experience with the use of crosslink polyethylene resins. • Proven track record in manufacturing safe, reliable plastic fuel tanks meeting stringent government and industry standards. • Inca provides a highly qualified team of mechanical, industrial and process engineers to ensure production of each product to client specifications from design through product assembly. Important engineering tools include Solid Works and 3D Solid Modeling. • In-house tooling capabilities minimize any downtime and ensure completion of client projects without delays from outsourcing. • Our ongoing support and involvement on committees and boards of associations, such as the Association of Rotational Molders, National Marine Manufacturers Association and the American Boat and Yacht Council, has given Inca specific insight and knowledge into new technology, regulations and future opportunities that benefit the manufacturing of our customers’ products. • Leader in developing new materials in conjunction with chemical companies to meet EPA standards and create new product applications. SeaStar Fuel Solutions provides its customers with the expertise, attention to detail and quality control measures that guarantee you an excellent product. A highly qualified team of mechanical, industrial and process engineers ensures production of each product to client specifications. Each product must pass several quality inspections before it is allowed to be shipped. The manufacturing plant operates five rotomolding machines in a 60,000 square-foot facility. The company’s capabilities range from small custom orders manufactured to engineering specifications, to high quantity run requirements for designs of all types. The manufacturing facility is located at 6400 Louisiana Ave., Nashville, TN 37209, and easily handles projects and shipments throughout the Southeast. Inca’s Tooling Department allows flexibility and ability to make quick modifications to meet your production schedules. The Inca team is able to maintain and make most repairs and modifications in-house to fabricated molds. This ability significantly reduces downtime and increases Inca’s manufacturing productivity. When your production requirements have been completed, the mold is sent to the mold shop for routine maintenance inspection. The mold is cleaned, and any minor repairs are performed at that time. Proper maintenance helps increase the life span of the mold and promotes production of high quality parts run after run.